Michael Epps’s weekend at Thruxton proved a promising one, with a hat-trick of points finishes across the three Dunlop MSA British Touring Car Championship rounds, including a breakthrough top ten result in the final race. 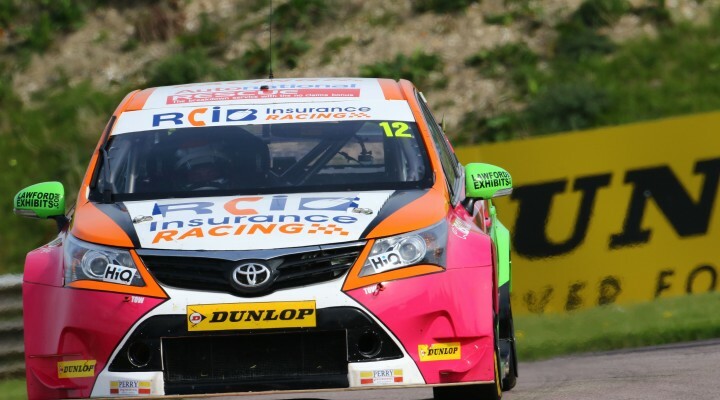 The RCIB Insurance man notched a maiden points finish last time out at Donington Park and a trio of battling drives in his Toyota Avensis yielded eleventh, fourteenth and tenth place finishes in Hampshire. After a below par Saturday at the fastest circuit in the UK, with a lack of running in free practice, a difficult qualifying session saw him muster only 22nd on the grid for race one. Epps progressed nicely at the start of the opener, working his way up to 16th by the third tour before picking his way through a dramatic final corner accident on lap twelve to take ninth position on the road. This became eleventh when the result was declared on count-back after the red flags were waved. Retaining his top twelve position throughout the opening stages of the second encounter, Epps moved up to a high of ninth at mid-distance and had eighth in his sights. Trying to defend and attack at the same time, Epps was forced out around the back of the circuit late on, dropping back to an eventual 14th place finish – his consistency and tyre management left him confident for race three. Another battling drive in front of the ITV cameras saw the Team HARD ace make good ground on the way to the cusp of the top ten scuffle as rivals faltered. Epps set a fastest lap bettered by only one driver ahead of him en-route to his tenth place finish. “It was a case of being patient and powering through this weekend,” said Epps. “We had some issues yesterday, but we managed to rectify the situation and that allowed us to have a positive race day. “Qualifying wasn’t the strongest showing, but we didn’t get the perfect lap and we know our race pace would be stronger than where we started. A lot of people were impatient in the races and we were there to pick up the scraps. “A first top ten and three points finishes are a couple more milestones reached for us, and to be consistently in the top fifteen across all three races shows that the car is there and I can race with those drivers. Epps maintains his top-twenty standing in the overall drivers’ championship and a top ten position in the Independents Trophy ahead of the visit to Oulton Park in Cheshire for Rounds 10, 11 and 12 next month (04/05 June).